Despite the multiple changes of red lights to green and green to red, she didn’t move. She was stuck there. There simply was no moving ahead to the adventure that awaited us ahead there was only – us and this cart-lady. Here eyes met ours inside the car. Ever noticed? Often, this is how it is with worship. Something moves before our mind and it gets stuck there. It feels that there is no moving it. Sure, we want to drive ahead and sing God’s glory, yet that cart of worry and distraction stands before us. It is all we see. We miss his glory. We can’t behold the treasure he wants us to see. We can’t move into the joy of his presence. What are we to do? Well, that day, we paid the lady off. I can’t suggest you do this (it won’t work well with God), but I can suggest you dismiss distraction in a similar fashion. Pray. Ask God to remove what is pestering you to move in authentically worshiping him. See yourself hand it to him. Ask him to hold it for you, to tend to it and to bring clarity to that situation. Surrender. Truly let go of what you just let go of. Just be. God doesn’t need you to put on a show for him, he just desires your needy heart come to him. Often, worship is the act of saying nothing, while you know he is everything. Worship is coming needy and unknowing to Him who’s moving and pursuing you passionately with love. It is bringing your poverty before him who is rich. It is letting him hold you as you are. It is climbing onto the lap of His care. It is looking at his face with awe, admiration and appreciation. It is waiting to see what he will do – with you. It is not performance-based, but heart-abandoning. Worship is not only about hymns, but it’s about humble openness, willingness and readiness to soak in the Creator, the Author and the Perfector of faith. 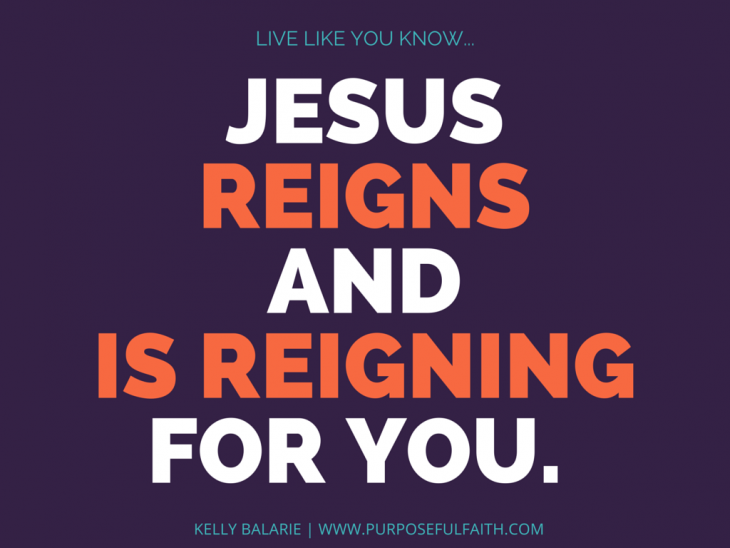 It is about seeing his glory beyond the alerts, schedules and notifications continually pinging you. It is about getting quiet in the rush. It is about listening for truth over lies. It is about asking for more rather than existing with less. It is about being with Him. My writing chair, is more of a writing chaise, it faces my patio where I watch birds peck around for their next God-promised meal, pesky groundhogs graze on my grass and raccoons duck their heads into the light. But, what my eye is drawn to the most is that small, sweet little chipmunk – the one that so often pounces around my (ahem, dead) flowers. I love these little chipmunks. They are so sweet, so precious, so free of long tails, glowing night eyes and stinky smells. They touch my heart because when I look at them – I see innocence. Pure, humble innocence. Not savage instinct, but a joyful presence. They are the good amidst the smelly. The humble amidst the powerful. Christ kind of looks this way too – the spotless lamb that shines out among dirty humanity. The pure vessel amidst the ugliness of sin. The joy to behold in a world that has a ravage hunger for everything it can consume. Jesus – a walking breathing sacrifice, always giving, completely offering, genuinely treading earth for those who need his touch – a spotless, sweet, pure and whole example. And, while the chipmunk is no equal to the Savior of the World, the chipmunk surely has been created by him. And, he shines his glory all the same, because all creation has been made in adoration. I guess this is why God kind of stopped me in my tracks this morning (literally). You see, as I drove my car, I saw him. Right in the center of the road – my chipmunk. Dead. Pure. Humble. Small. Run over by the world. Just lying there, on the ground. Slain, undeserving of that pain. Like the pure one. The beaten one. Driven over by our sin. Thrust down even though he offered so much. White as snow and humble down the road to death. We forget that image sometimes. I forget it. But, I don’t want to forget. I want to remember. I want to hold it like a locket over my heart that protects all the goodness, the love and the renewal packaged within. I want to hold it so tightly that it seeps right out of me into the savagery of this world. To the customer service lady who drives me up the wall. To the husband who had too quick of a retort. To the bills that stack high. To the children who need a little too much. To the poor who I would rather not see. To the friend who really does need a helping hand. To the coveted time I don’t want to dole out. To my heart that can’t forgive – or forgive itself for that matter. May his purity laid down for us, seep right into us and out of us. He loves us that much. Cleanliness, slain – to reach our pain. 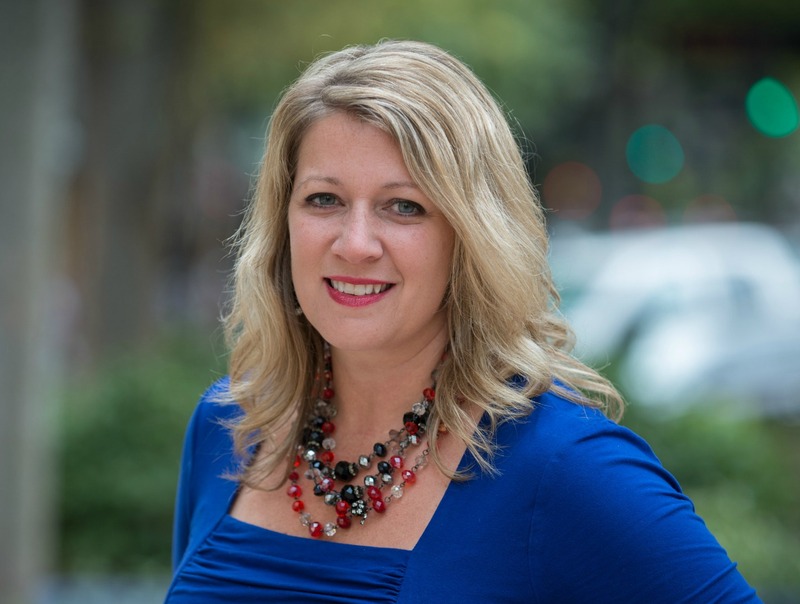 Hope, released – and purpose gained. Life, secured – so we may endure. None for him and all for me. One day, every knee will bow, tongue confess, mouth sing, heart see, eye understand who is King. until then, let’s live today like we do. …to the one and only. To the one who deserved royalty, a crown, an 11-course tasting menu, the heights of glory, the strength of power, but who endured the status of the worst sinner, the ridiculed idiot and the lowly donkey rider. Let’s lift our hands to him today. Let’s see his glory reign today. To the one who lives, holds all power and waits for our much-anticipated arrival. This is my view all week, sunup to sundown. From this day forward, I think I’ll refer to the Atlantic as–The River of Delights. Which makes me feel like Anne Shirley, but it’s true. Is there anything so irresistible? Crowds pour onto the sand each day in agreement. The ocean overwhelms me, with shades of blue as far as the eye can see. Something about standing in front of this vast body of water lulls me home inside. When I’m here, I remember–this power is God, this beauty is His, these constant waves roll in like good gifts He’s always giving. He shows us the path to life. He fills us with joy and eternal pleasures. He fills us with good things. It is good to be near God. We could fill pages with similar lines from Scripture. Is this how you see God? Sometimes I’m oblivious to His delights. I miss this part of Him. Yet joy and abundance and life are part of who He is and what He offers us. I wonder how we ever walk through days without this consciousness. Maybe delight is crowded out by a critical spirit or cynicism or complaint. Maybe we’re focused on what we bring to the table instead of who God is. Maybe we fail to understand the whole picture of Him or we simply forget. His living and active Word and His stunning creation repeatedly remind us. We feast on the abundance of His house; we drink from His river of delights. But who? Who enjoys this abundance? People who take refuge in the shadow of His wings. When I think of taking refuge in God, I assume there’s danger–some kind of storm. A cancer scare, a searing loss, a terrifying fall or some other difficult trial. Many verses speak of taking refuge in God as our shelter from danger or sickness or troubles. But I find an interesting connection between taking refuge in the shadow of His wings—and joy + delight + abundance. What does it mean to take refuge under His wings? Some versions call this hiding ourselves in Him or putting our trust in Him. It also means we find JOY in Him. We seek Him above all else, and we see all these earthly pleasures as gifts He sets before us. Every sunrise, every sunset. Every ocean. Every mountaintop experience. Every encounter with people we love. Every delicious meal. Every ordinary day. Every vacation or adventure. It all comes from the abundance of His house, another satisfying drink from His river of delights. In sickness and in health, through storms or sunny days, may we revel in His gifts, with hearts turned toward God. May we live, deeply grateful as we hide in Him, taking refuge in the shadow of His wings. Linking with 3D Lessons and Faith Barista. Ascribe Him the glory due Him. Proclaim His majesty. Be in awe before such power. 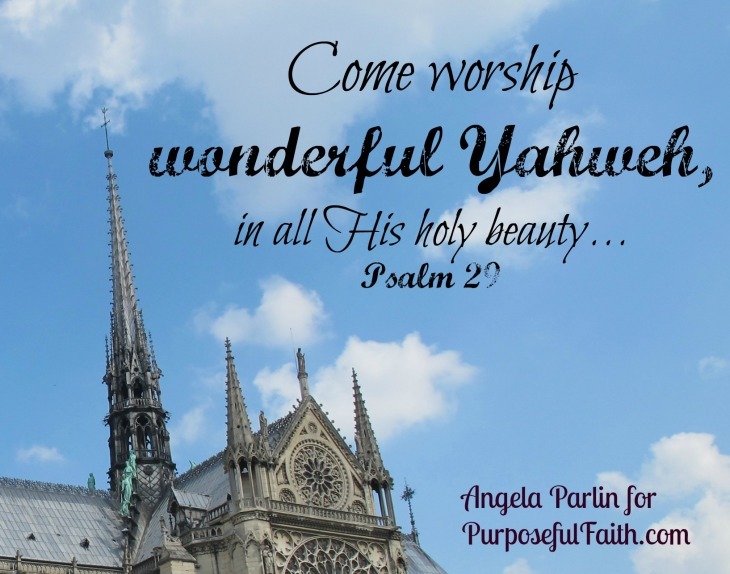 Come worship wonderful Yahweh, in all His holy beauty. Give Him the honor due His name! One of my highlights this year has been sitting with the Lord alone most days, praying without multitasking. In this time, I worship and adore God, confess my sins, thank Him for an incredible amount of blessings, and pour out my cares before Him, asking for His help. I had no idea worship would become the part of my prayers I long for most. I didn’t realize I would set out to give the Lord the honor due His name–yet I would receive so much blessing. It’s not that I failed to worship the Lord before. It’s just that I didn’t take regular time away from other people–and other tasks–in order to worship Him alone. To worship without multitasking. 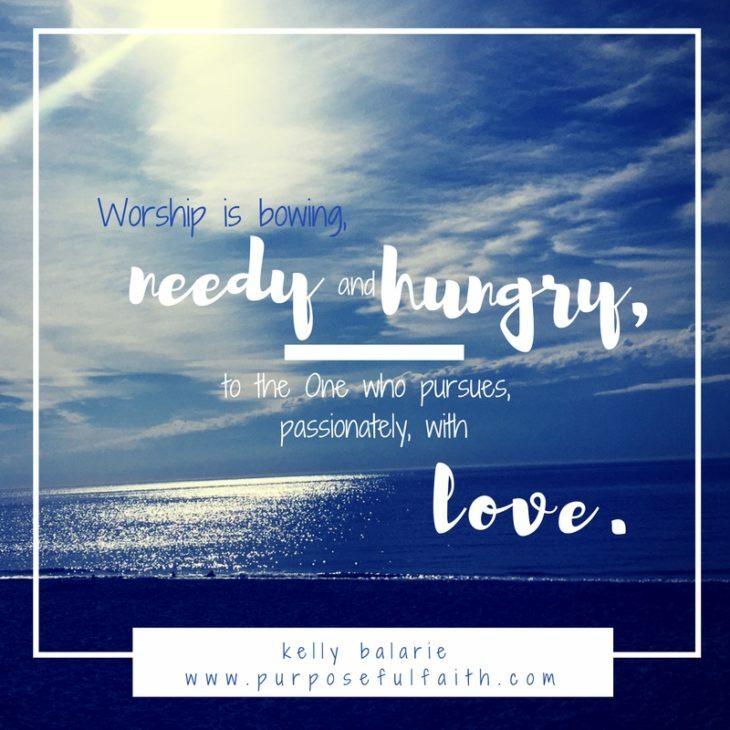 But what is worship, really? Worship is often more than sitting with God alone, in prayer and song. Look up the definition of worship, and you’ll find a number of ideas. Some think worship is a service you attend, a feeling you have toward a deity, or homage paid to God or another sacred object. True worship begins with a view of God’s mercy. We have done nothing to deserve His kindness, yet He heaps it upon us. His mercy includes His unending love for us, even while we were yet sinners, His grace and forgiveness, eternal life by faith, our reconciliation to God, the gift of the Holy Spirit, newness of life, peace, joy, hope, freedom, and even more than all of this. Just try to remember God’s mercies toward you, without being moved to worship. It’s impossible! So we worship God, by focusing on His mercies, by preaching the gospel to ourselves again and again, because we so easily forget who God is, the depths of His love for us, and all we have IN Him. Paul urges us further, to offer our bodies, our whole selves, to God. This is our action step. We present–or give over to God’s control–our bodies, including our heart and thoughts and attitudes. We do not follow the pattern of the world any longer, because as we offer ourselves to God, He cleans and changes and renews us. This practice of viewing God’s mercies, of simply remembering who God is and telling Him, has surprised me this year. The more I worship God, the more I adore Him in my heart. My whole life falls into clarity when I adore God and remember who He is, and who I am in light of Him. My cares and concerns don’t disappear–but they fade behind the majesty of God. So everyone, let’s worship the Lord. Let’s remember who He is, in all His holy beauty, and give Him the honor due His name. We are two weeks into the new year, and I’m ready now to declare my word. Near the end of last year, I thought it might be strength—as in living in God’s strength and not my own. I wrote it on the front page of a new journal, but it didn’t feel like “the one”. As I studied strength, it took a backseat to prayer. Because there’s no living in God’s strength without wholehearted, earnest prayer. 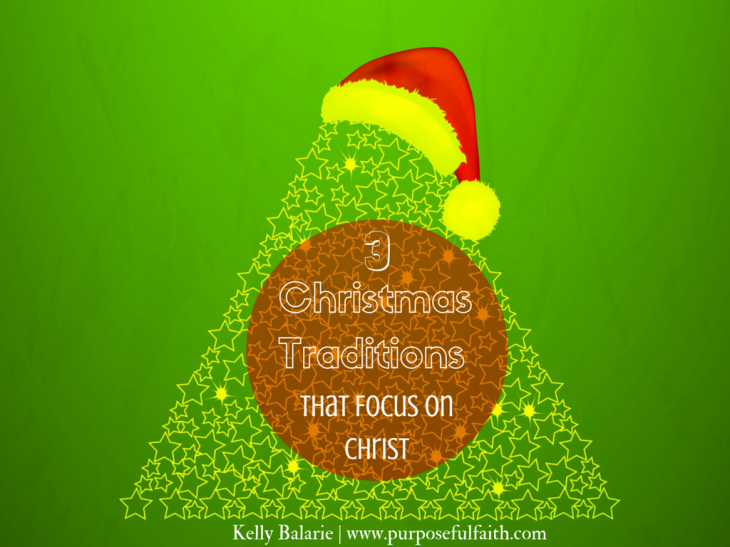 So this year my commitment is simply to Pray–in a consistent, intentional, wholehearted way. I don’t know if it’s the same for you, but I think some prayers are easy. Many years ago, I read about practicing the presence of God, and started a habit of talking to Him throughout the day, believing He’s near. I whisper lines of thanks or requests for help to God throughout the day. I ask Him regularly for wisdom, especially as a Mom. I keep a list of family and friends’ needs, knowing He waits for us to come to Him, and He listens. I trust that God is able to do more than all we ask or imagine. We have needs, and God is able to meet them. Furthermore, we are busy, so these throughout-the-day, on-the-go prayers work for us. But other times, prayer feels hard, even unnatural. Other times, prayer requires us to put down everything else we’d like to do at the same time. That’s the kind of prayer I struggle with. To put that more honestly–that’s the prayer I often don’t pray. The one where I close the door to my world, and enter the presence of God, with only God and nothing else. What about you? Do you regularly slow down to be with God alone? I don’t think it comes naturally to most of us, to make a full stop in our lives and stay with Him a while. We tend to do everything in our power, first. We rely on ourselves instead of relying on God. We value self-sufficiency, and pride ourselves on independence. Or we’re rarely alone, and when we are, we turn on something noisy, so we don’t feel alone. In my quiet times, I love studying books of the Bible. But the hard part? Pouring out my heart to God and listening for Him through the silence. Which is to say–I like to learn about God, to get to know Him through His Word, but I struggle to just sit with Him. Back in December, I wrote down a few goals for this year. Since then, I’ve realized my goal above all goals for 2015 is to spend time each day, praying without multitasking. 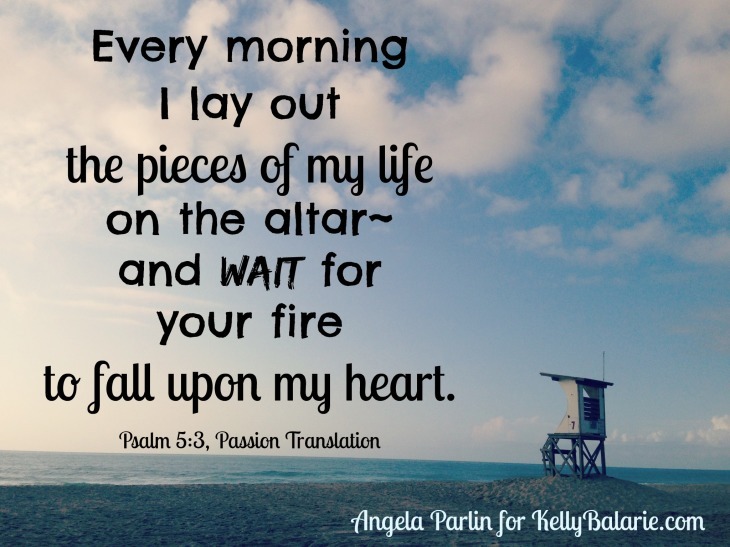 I commit to daily adore God, thank Him, confess my sins, and lay my requests before Him. And then to wait in the silence for His Holy fire to fall upon my heart. 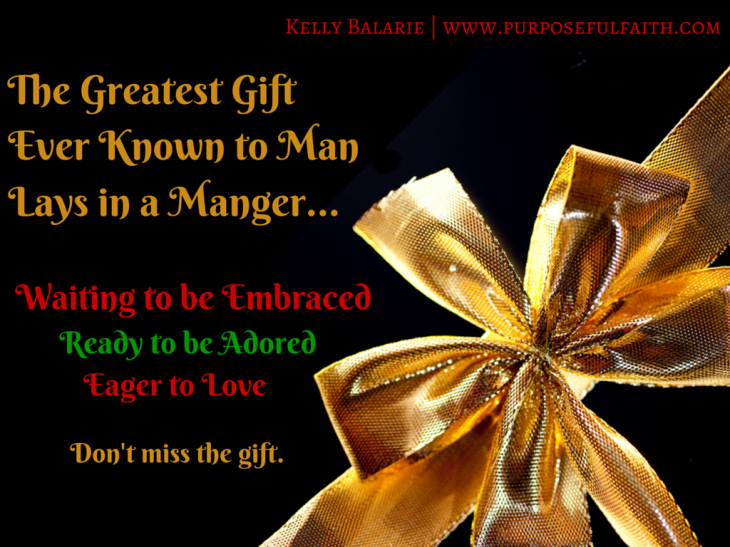 ***Don’t miss Purposeful Faith blog posts. Get them via email. Click here! Honestly, I haven’t been one for too much Christmas tradition. It’s not that I don’t care about Christmas, because clearly it is one of the most important holidays, but I tend to get super busy at this time. It can be hard to add one more thing to do, when I can hardly keep up with what I already have to do. Do you get me? I am so busy being busy that I can’t slow down to make things matter for my family. Sometimes, the Lord drops things on our lap, to make us realize that we can’t get up unless we address the issue. I think this is exactly what he did here. **Also, subscribe to my blog posts via email and have a chance to win an Amazon Gift Card. Click here.